Hello everyone I’m new to the forum, And I have some question about request for evidence form after my N 400 interview on 19 March. So my story was that I marry an US citizen back in 08/2014 but we did not file for green car until 2015, and I receive my 10 year permanent green card in May 2018 and I start to apply for my citizenship application in August 2018. My interview was scheduled for March 19 and I attended the interview by myself my spouse did not come with me. The thing is that our accountant just finished filing 2018 tax return a day before my interview date and for this year we actually owe tax to the government. During the interview, after the civic test, the officer said that he saw my tax return for 2018 when I was opening my folfer and asked to see it. when he found out that I did not pay for the tax return He said that he will have to send me an RFE notification to ask that I submit additional document proving that we have paid tax. Right before we submit the application in August we move to the new address and we have been living in the old address (in laws house) for 4 years and because of that when I create this application we did not have any document pointing to this new address. 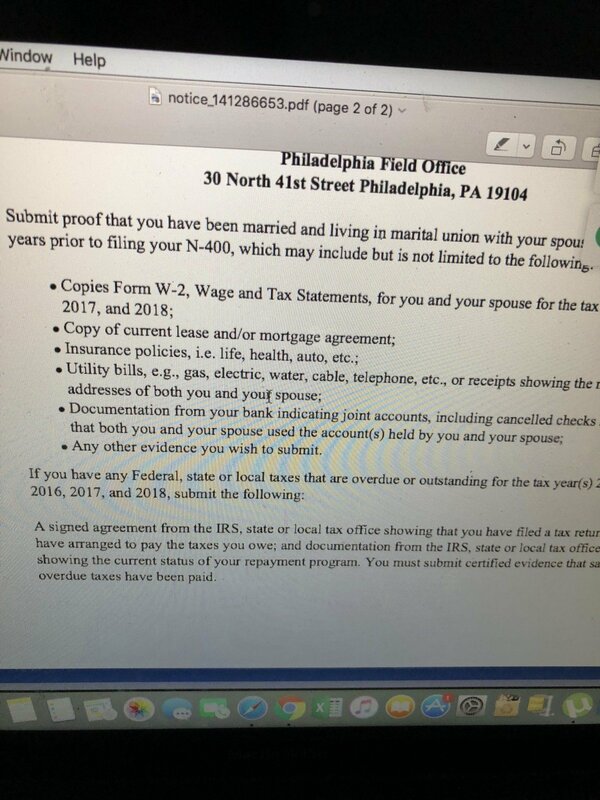 The officer then asked to see the lease or insurance bill document about the new place but unfortunately I did not prepare enough and I didn’t bring it so again he said to send additional document with the tax 2018 to show that I have been living with my spouse for the past three year he said to mail all the evidence to the office (Philadelphia). At night I checked my online account I saw the rfe form under documents tab, and found out you can actually submit all these documents online. We don’t have a lot of document related to the new house since we only move here for like 8 months we have the lease, bank document, our credit card saying that he is on he’s an authorized user, some utility bill and tax return. The RFE said to submit W2 for 16, 17, 18 and I’m worried because for this tax year my W-2 was sent to the new address while his is still at the old house. Even though since 2014, all our w2 were coming to the old house. I already created a cover letter listing all the docs we will be submitting, and i think i will include some from 2014-15 too just to show that we live together for a long time and since we don’t have many docs for new address. I lost the folder that had many documents for the removal of conditions so now the joint bank acc we had is already closed. He is very bad with financials so his credit score is bad and he has to be under my account. Do you think these document that I listed are sufficient for the RFP and also if you have received an RFP for your application do you know how long it would take for them to reopen the case and give me a decision? Thank you all for sharing I really appreciate it, sorry for the lengthy post! If you got a similar RFE letter as us it says May include but not limited to. May does not mean Must. It's giving you common examples of what you can submit. You cant submit what you dont have. We dont have joint checking so we couldn't submit that, we don't ever keep our W2s just tax returns so we don't have W2s for them either but we have all our tax returns. Just try to provide anything and everything with both your names. And I'd advise getting a lawyer, we are utilizing one right now. Thank you again. I just found out that you can go ask bank for statements from closed account so i will try to do that. We have driver license with same address but both at old house so i hope they will look at both locations that we reside. If you create an account online with IRS.gov, they have your w-2s transcript online so you can download it. I will try to submit everything and see how it goes. I thought that was just tax return and tax account transcripts. The w-2s are generated by the employers. Too late now we've already submitted. I could upload extra things in the Unsolicited Evidence section. If N400 is denied hopefully it doesn't revoke permenant residency. Not owing taxes to IRS is one of important requirement to become US Citizen, infact there is specific question on N-400 form "Do you owe any overdue Federal, state, or local taxes?" which means you needs to take care of any taxes owed to govt as part of Law Obedient Citizen. Interview is to determine if your past / present US residence supports to become US citizen. Being said all this - IO was only doing his job, take care of 2018 taxes and send out document - you should be good after evidence is submitted that you took care of taxes. I didn't know you could do both. On the website before I submitted docs it said we only had one opportunity to send it in just one shot. So I assumed that also meant you can only choose one way or the other. That’s what i hope too, since it will be faster to process. Thank you for your advice! Won't they get confused if it's submitted online and by mail? What said you could do both? The letter we got in the mail (the same as the doc on the website) says send everything at one time. Nothing said we can do both but im just doing it to see if it’s any faster. The letter specifically said to Mail it to the address underneath (my letter very similar to you except the location and the evidence he asked for) and the person on the phone told me to follow what the letter said so im just doing both. It wouldn’t hurt I don’t think so. Very similar to ours but I can see the differences. Are you submitting everything listed? We don't have and never have had a joint checking account for security reasons in case one of our accounts gets broken into (mine has 3 times). Hopefully not our Achilles heel that causes a denial. But we can't submit what we don't have. If it gets denied we will be requesting a hearing in court. They give you that option when they send denial letter.